Designing a walk in closet for home isn’t hard today.We can do it by ourselves by applying a lot of walk in closet ideas from the internet. There are so many options of design we can choose, and each design is usable for any home designs. 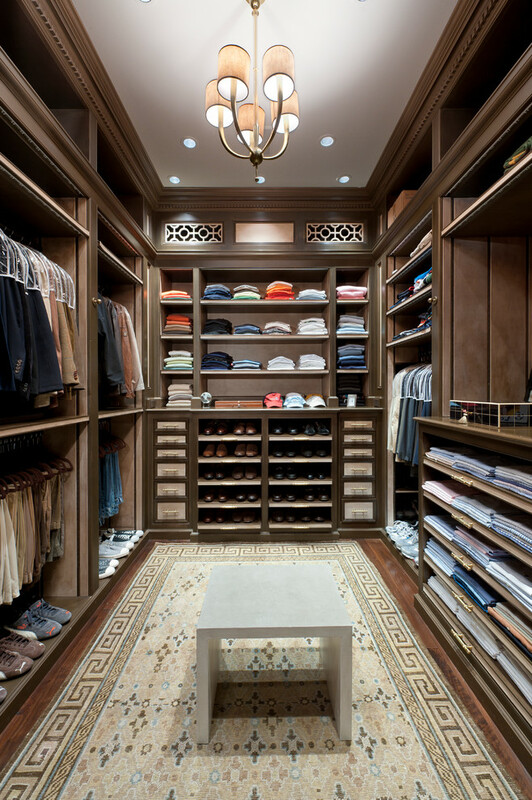 Find more ideas of walk in closet for your home here, and select one that suits your preference and storage needs. 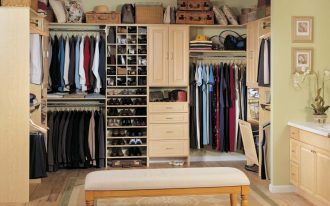 Create your own walk in closets by using unused ware in your home. This one is an easy-made lightweight ware closet solution which is painted in fully white. 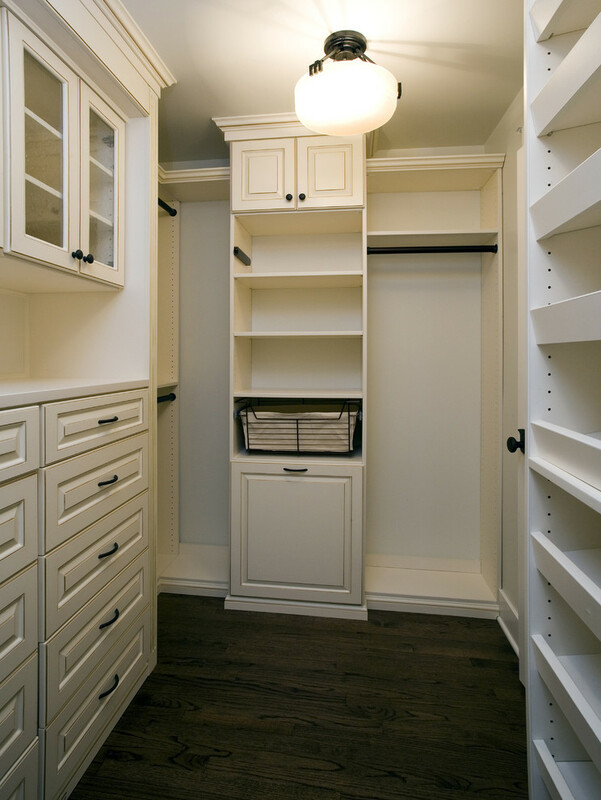 This closet storage consists of pull-out baskets, shoes shelves, and lower & upper cloth hang sections. 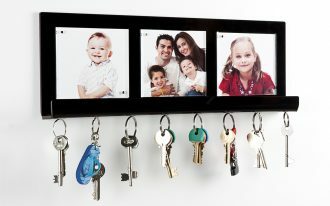 Each item provides best and well-organized way to storing wardrobes and other similar things. 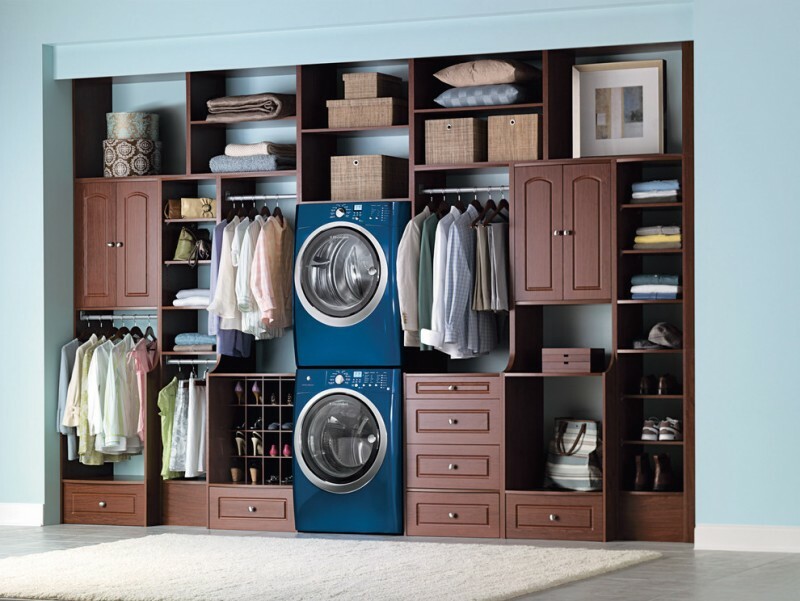 Need the best storage for your laundry room? This one is so inspiring and recommended to apply. Wooden closet storage has been colored with dark-tone finishing to create a contrasted color tone over the laundry appliances. 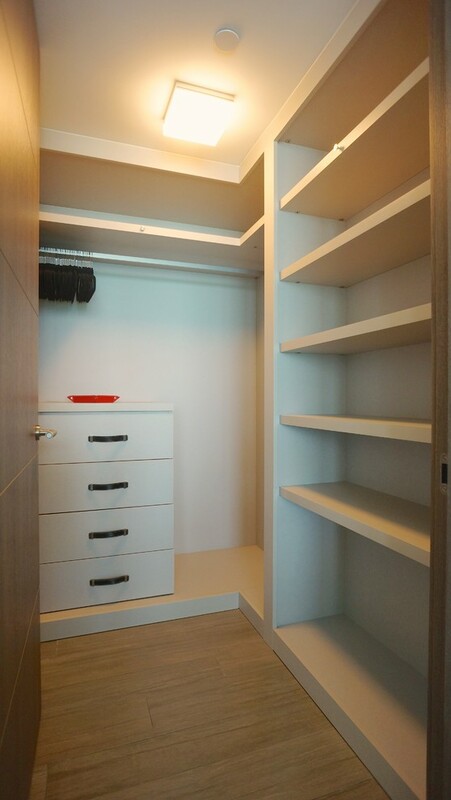 This unit of closet has been attached with different kind of storage solutions like shoes shelves, cabinets, open shelves, baskets for storage, and hang sections for clothes. Well, this one suits for a house with small rooms. The closet has many storage options such as cabinets, glass-door storage, glass-door shoes storage, hang sections, and drawer system. All units are colored in white to make them stunning over the hardwood floors. A unit of mirror is a perfect complement of walk in closet. You can use the additional storage system which is commonly attached behind the mirror. This idea has a modern look yet been covered with cedar finishing. 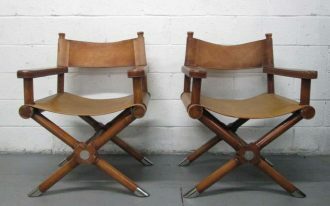 It shows that cedar-finish can also be used for modern-style furnishing idea. The storage looks so simple and elegant with dark glass panels and drawer system. A medium-size & frame-less mirror also adds the closet’s elegance. 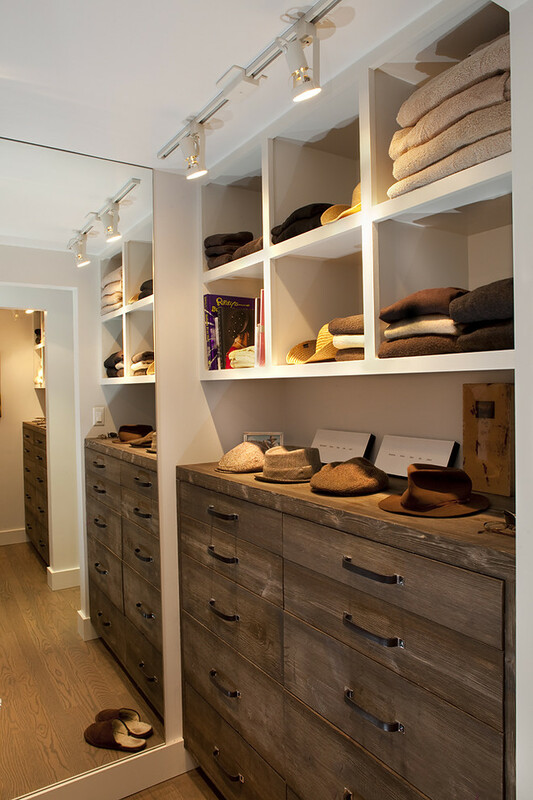 Smart and practical; two words reflecting this walk in closet idea. The idea highlights the narrowness and white finishing as the attractiveness. Closet system inserted in the unit has also taken people’s heart. 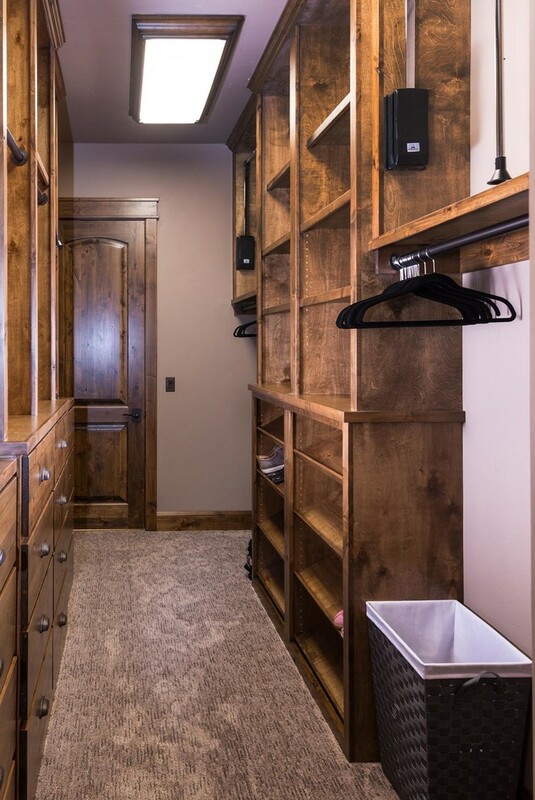 This walk in closet storage is kept beautiful in bright nuance with many storage options which are highlighted with hardware and dark wood surface on drawer system’s top. Light beige rug is an accent that gives special spot in such fully white closet storage system. 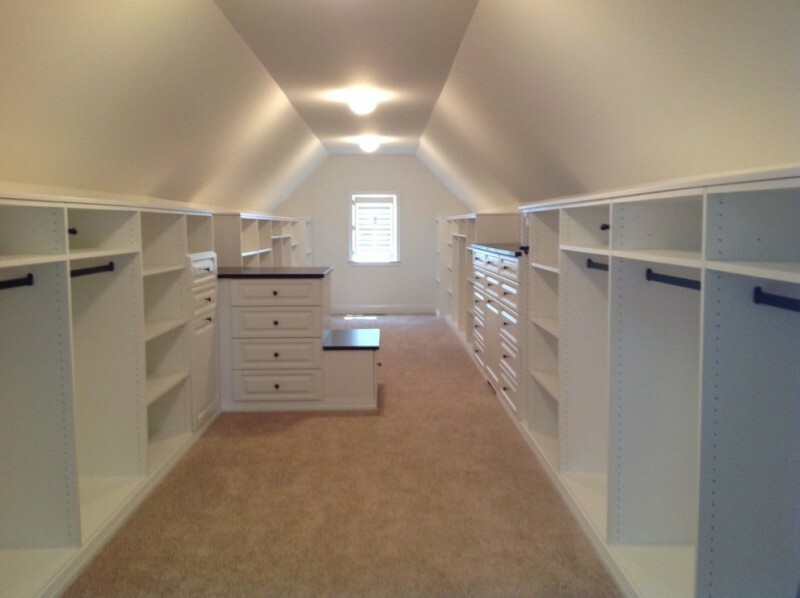 For you guys, this is just one of walk in closet ideas you can select to your lovely home. This one is really simple but attractive with flat-panel cabinets, hang sections for clothes, shoes racks, and open shelves. All is made from hardwood. 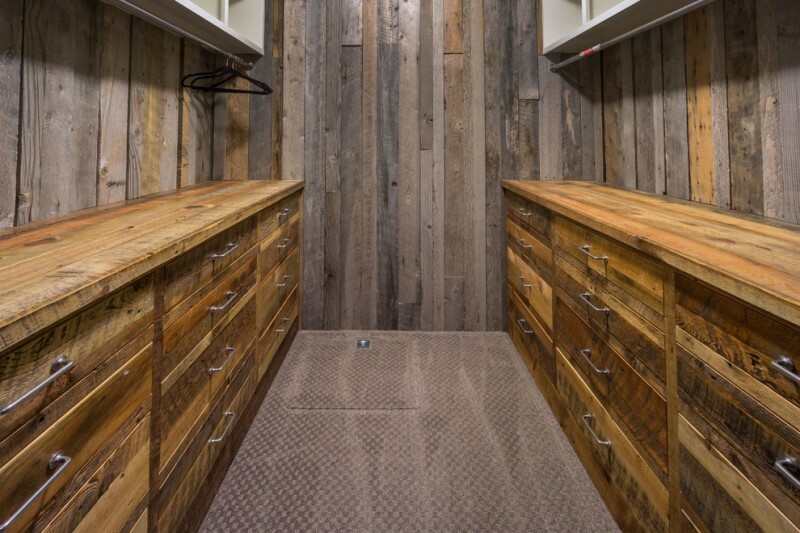 Modern rustic can be seen from the material used to build this closet storage system. Flat-panel drawer system is designed in modern rustic and it has been completed with rustic metal handles. Then, the arrangement of white open shelves is installed on drawers’ top. Such idea of installation is a brilliant since both rustic and modern styles balance each other. The spot lights provide a dramatic ambiance. 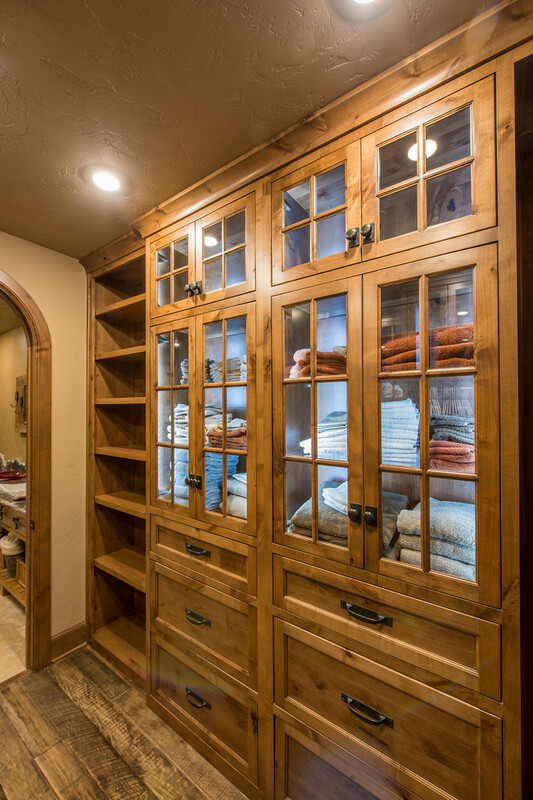 For rustic lovers, here is an inspiring walk in closet idea in rustic style. The closet is fully made of hardwood material and no finishing to cover them. It has many storage options, like flat panel cabinets, shoes storage, lower and upper hang sections, and a wooden chair for seating. Two recessed lamps are being added to provide a dramatically warm nuance. 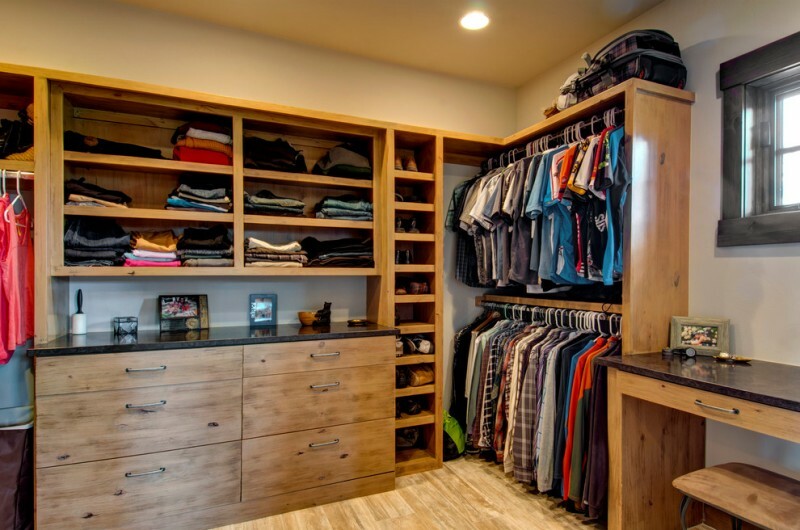 A bottom-to-top walk in closet is equipped with plenty of recessed-glass panel cabinets and flat panel drawer arrangement. Interestingly, each cabinet is supported with recessed lamp installed at the top of those cabinets. The lamps result bright lighting, making the stuffs stored in cabinets possible to see, so it makes the owner easier to take the stuffs she/ he needs. This is so marvelous. 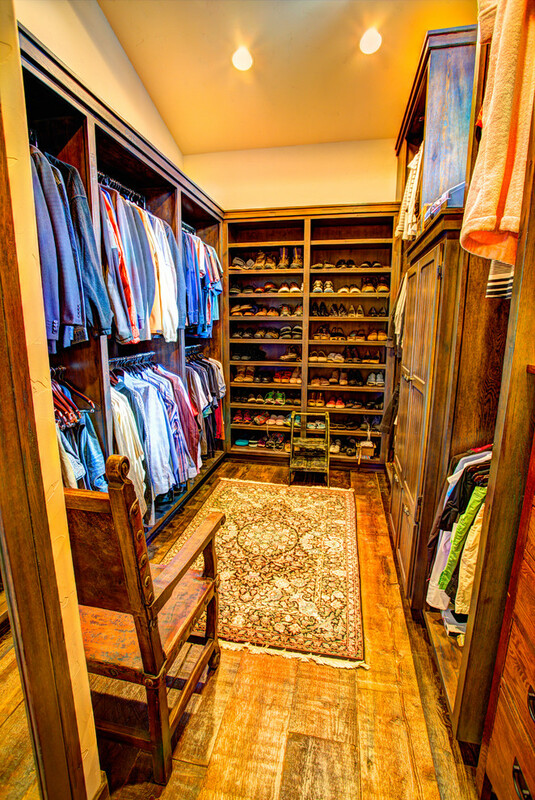 Old, shabby, yet stylish; it’s possibly a theme taken by the owner to describe this walk in closet. Wooden cabinets are kept original (without a finish). 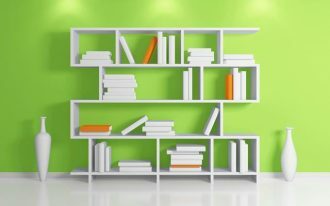 The old and shabby look represented on cabinets has been balanced by installing modern white open shelves. Brilliant idea, right? 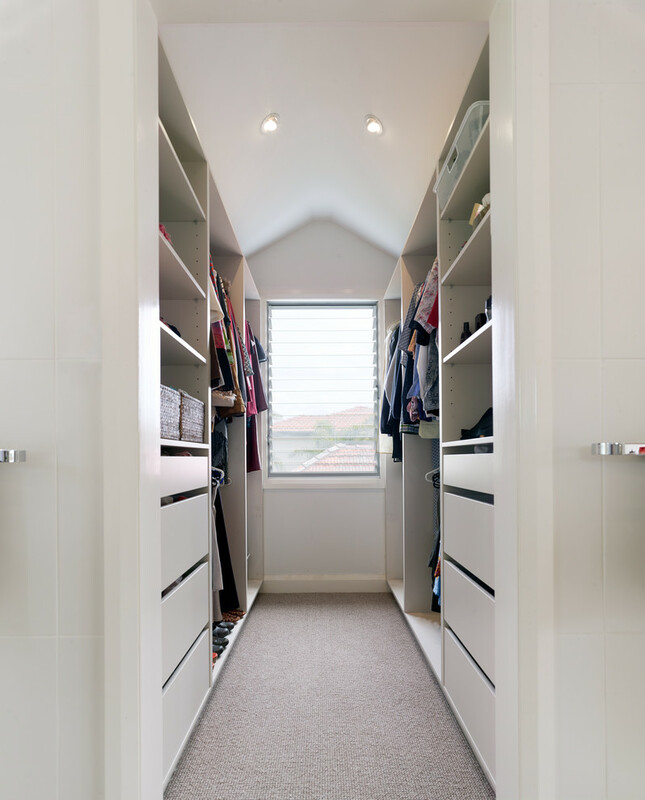 It’s a fantastic idea to create a space-efficient walk in closet. Select the wall-mounted walk in closet to save the space. 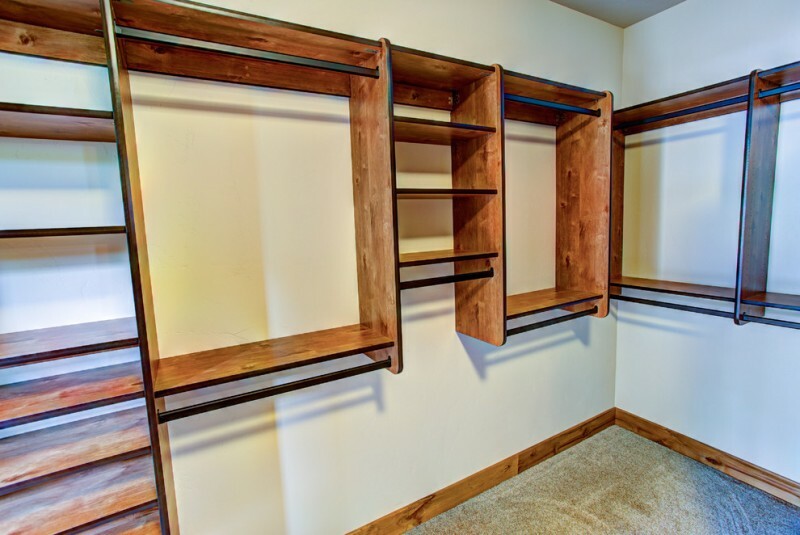 The closets are built by using hardwood supported by hardware pipes. These pipes, in addition, can also be used to hang the clothes as same as the hang sections. Maximize your garage by building a walk in closet. This closet, for instance, uses a ladder to facilitate the owner when she/ he wants to take the stuffs organized on upper shelves. 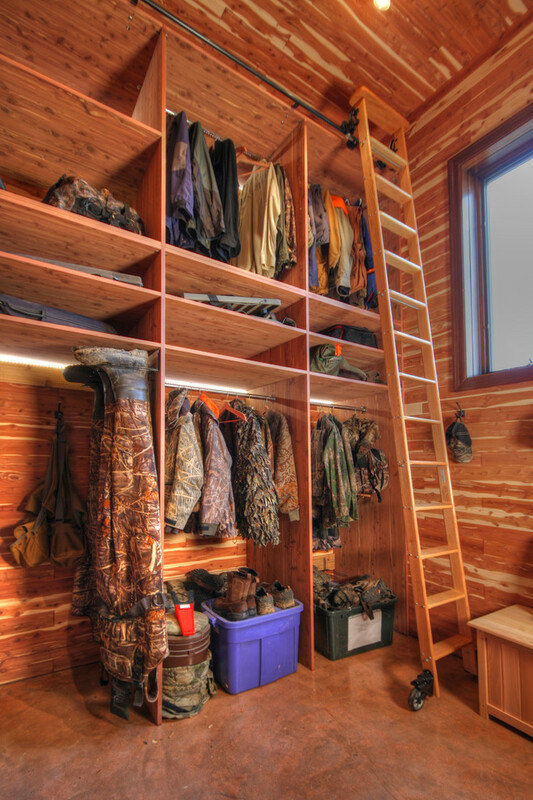 This kind of closet is so perfect to store and organize the outfits and footwear for gardening or outdoor activities. 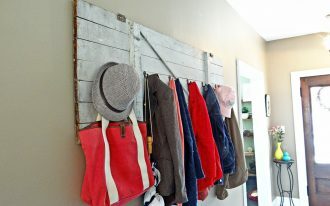 This is another rustic walk in closet idea. This one is supported with flat-panel cabinets and hard-metal pipes for hanging the clothes on. Both are staining with rustic-color tones. This closet storage system also has a medium-size basket for storage. It’s obvious to see that this walk in closet is actually created by removing little part of exterior’s deck. Then, the owner adds the storage systems in it. A contemporary walk in closet with white-finishing: it’s marvelous with the additional black accent applied on cabinets’ handles and hard-metal pipes for hanging the clothes. To have a little bit contrasting look, darker wooden floors have been added. Overall, this is great idea. 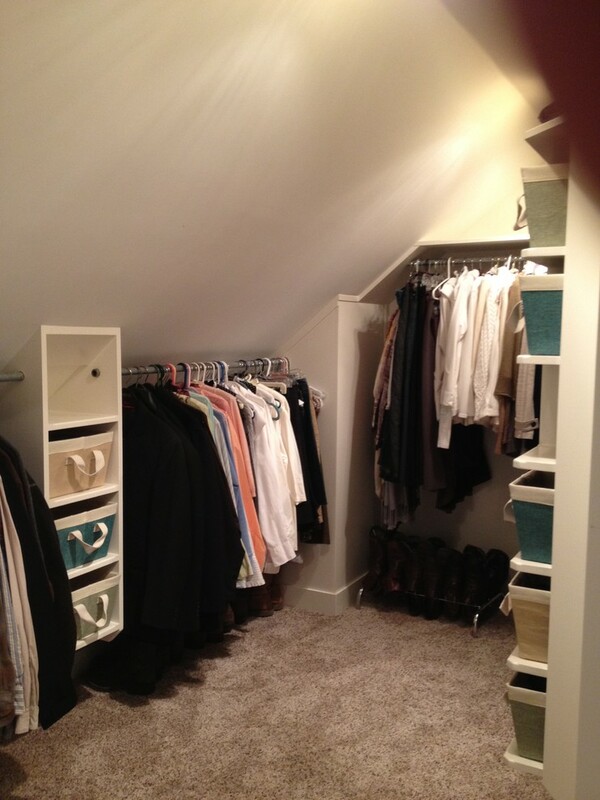 This is an idea of trendy walk in closet for neutral-gender storage need. It consists of medium-tone wooden cabinets, open shelves, flat-panel cabinets, upper & lower hang sections for clothes, and shoes rack. 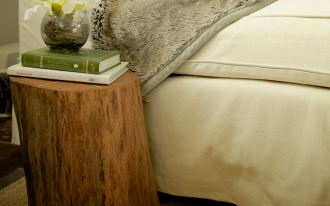 White and smooth fury rugs play crucial part of beautifying the medium-tone hardwood floors. 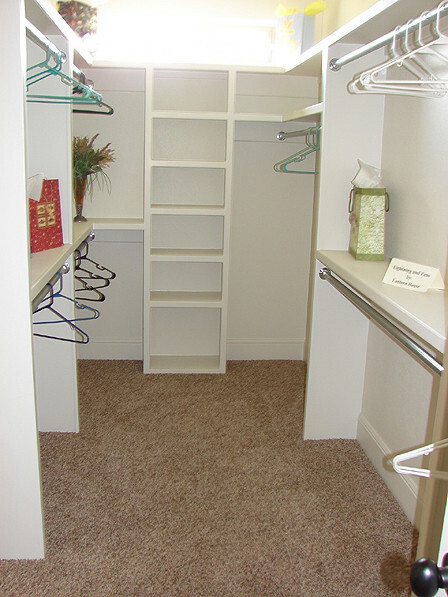 Need a small walk in closet idea for your lovely small house? This idea is one of most recommended ones. 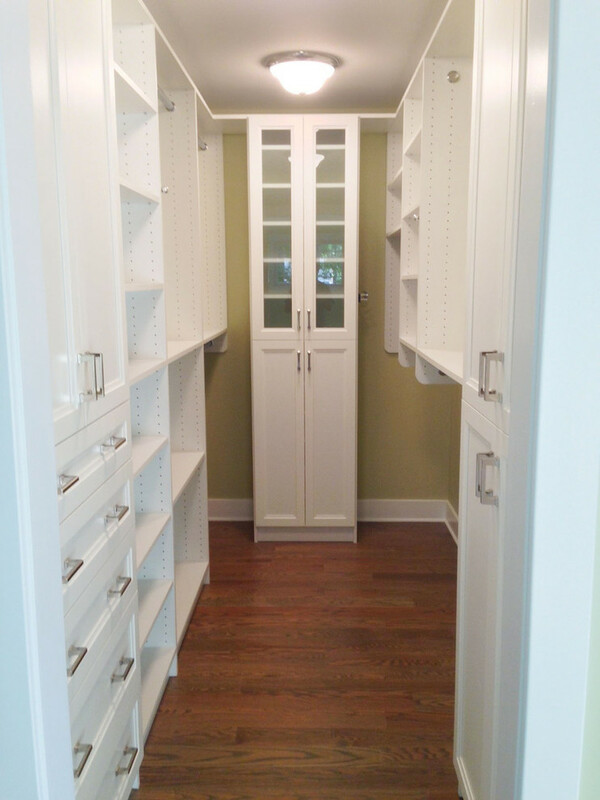 The closet is painted in white and equipped with chrome pipes for hanging clothes on. White is chosen to create an illusion of larger space. It requires to add a glass window to make your dressing room brighter. This one is an example. The room is full of lights coming from the glass window. 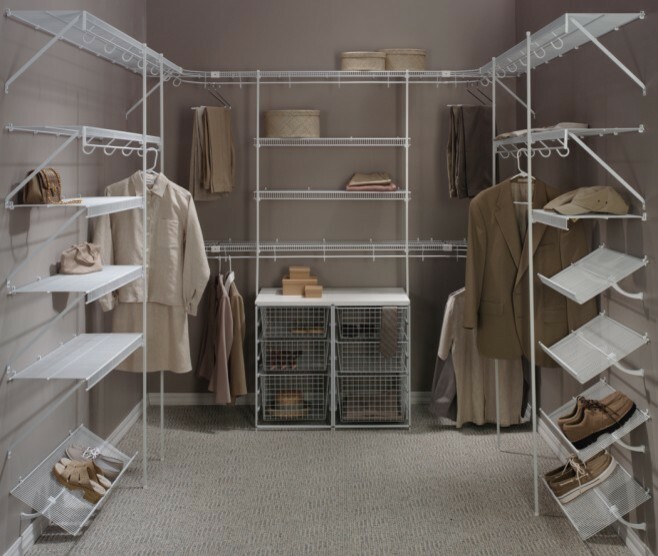 The bright also empowers white color tone that is used to finish the whole parts of closet storage system. If the window is impossible to add, a skylight is another best alternative. Create charm and warm-tone walk in closet by using light beige as the primary tone. Paint this color over the whole parts of closet, then collaborate it with a medium-size glass window at the one of walls’ corner. It must be a perfect spot to see while changing the clothes. Patterns on rug and the design of air ventilators are recognizable accents which have been identified as traditional influence. 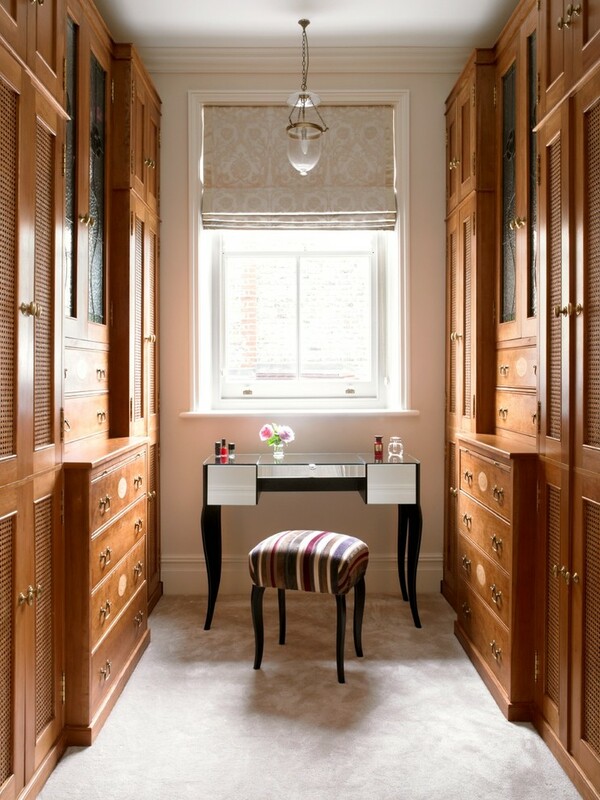 And, please take a look at the closet itself; the closet’s edges are also garnished with artistic traditional patterns. A white center table, in addition, is the accent of room where all elements are dominated by traditional style. Medium-height drawer system, open shelves, and upper & lower hang sections are designed in simple look. 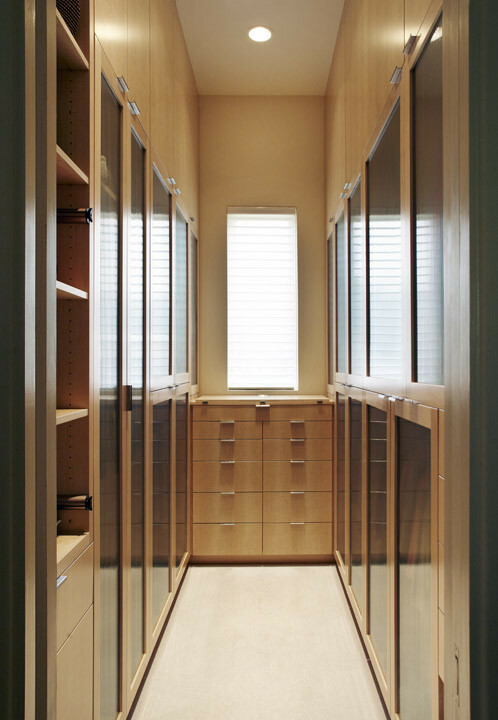 These closet’s elements suit to apply for a minimalist walk in closet. Add another color scheme like medium-tone hardwood floors to give an attractive accent for room. It’s not surprising to discover that most of men’s walk in closets are smaller than women’s. It’s reasonable to say that men’s stuffs, especially men’s outfits/ wardrobes are not as many as women’s. This is why men just need small closet storage system. 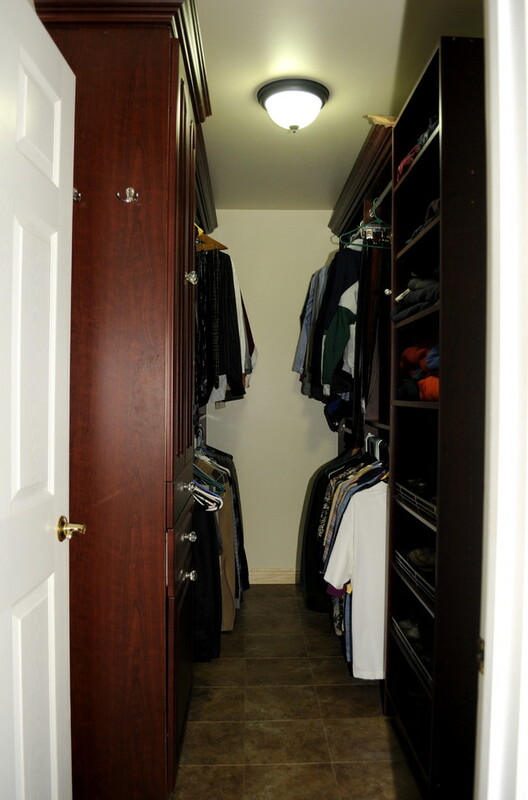 The men’s closets are commonly equipped with small-space cabinets, open shelves, shoes rack, and hang sections. 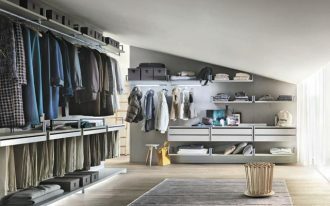 Keep your outfits or wardrobes well-organized by storing them in such walk in closet. 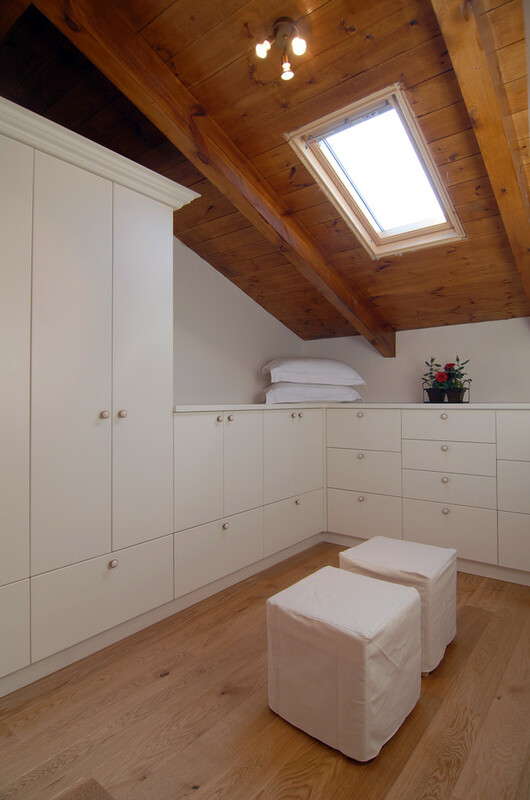 This is an idea of simple contemporary walk in closet which has been added with two ottoman slipcovers. In addition, a skylight here lets the cabinets and chairs much brighter. A corner walk in closet is a brilliant idea to make a space much more efficient. The corner of space can be used to attach chrome hang pipes for hang clothes on. The other side of walls, we can use them to put and to install the series of vertical storage system like a vertical basket arrangement. It’s uncommon yet stylish to install an angled walk in closet. 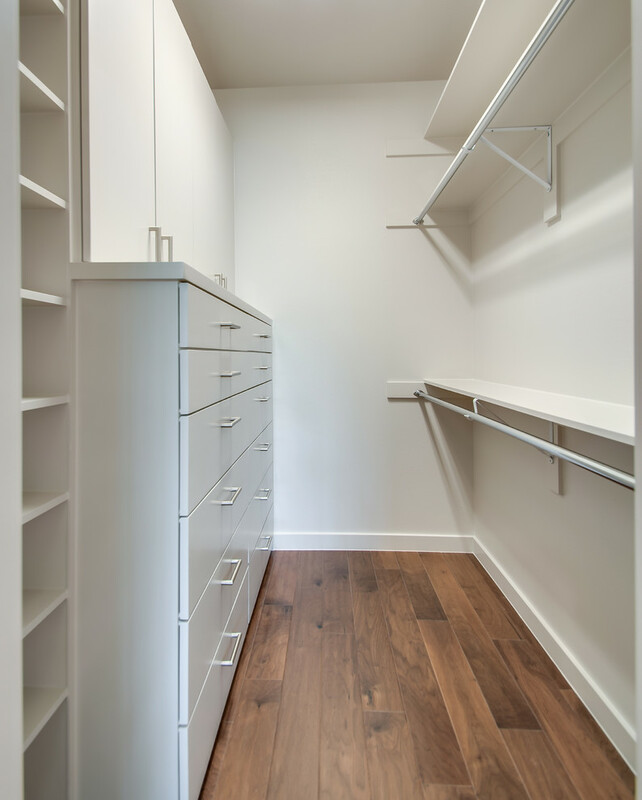 This kind of closet is commonly paired off with slanted ceilings that fit each other. Modern minimalist is so identical with maximum function and simplicity. This idea of walk in closet has accomplished to represent that criterion. 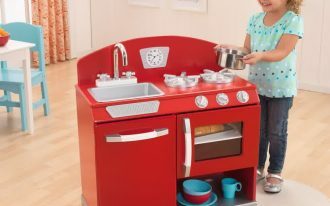 There are three storage options: long-panels open shelves, flat-panel cabinets, and chrome pipes for hang the clothes on. And, all those elements are colored in clean white. If you need a large walk in closet for your outfits, this one is so recommended. This melamine closet is built from many storage combinations, like shoes rack, open shelves, cabinets, and lower & upper hang sections. A large and white center table here is used to put something has been taken from the closet. 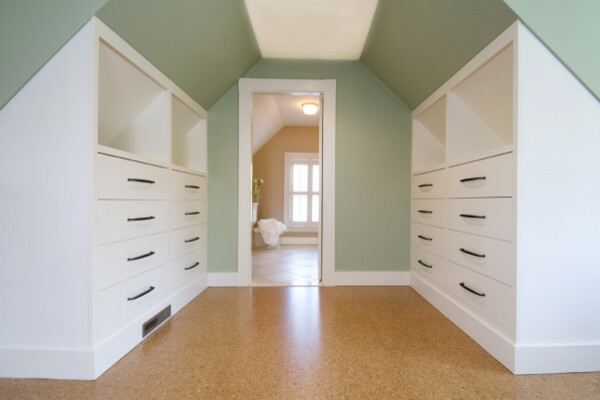 As we know, melamine is another best alternative of walk in closet materials. This material is long lasting for years and easier to clean. 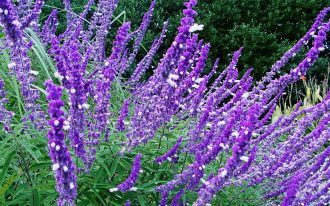 The color is also striking, so it’s available to be mixed and matched with other colors. This farmhouse is delighted with a glass window. The window provides the natural lights to enter the room. The window curtain, pendant lamp, and cabinets’ handles are clearly reflected and connected to farmhouse style.